Shantae: Half-Genie Hero was originally due to be released this month... on September 27 to be exact, but the release is being pushed back by about six weeks and the game is now set to arrive in November. Additionally, the planned PS3 and Xbox 360 versions of the game have been cancelled. Shantae is finally hitting the big time, starring in her first non-handheld release with Shantae: Half-Genie Hero. The game is under development by WayForward, one of the few major studios still releasing games in a 2D format, including Contra 4 and the Wii release of A Boy and His Blob. 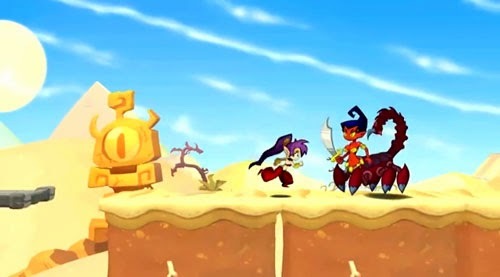 WayForward is also responsible for the original Shantae on Game Boy Color, as well as its DSi/iOS follow-up Shantae: Risky's Revenge, and its 3DS follow-up Shantae and the Pirate's Curse. This newest release will retain the core mechanics of those previous, with Shantae whipping her hair to kill enemies, exploring colorful platforming worlds, and doing the occasional bit of belly dancing. Shantae will use magical transformations to explore the land and even return to previous areas to access new paths, Metroidvania style. Like the studio's own DuckTales Remastered this game features 2D characters and enemies with 3D objects and environments. Check our full preview here. The game is releasing for multiple digital platforms: PC, PS4, Vita, Xbox One, and Wii U, along with physical releases for PS4, Vita, and Wii U.